For the last nine years, we have had all of our dental work done in Algodones Mexico...we have saved a small fortune and have sent many friends and neighbors to our inexpensive Mexican dentist. Everyone has thanked us for this money-saving tip. No one has been unhappy. No I am not out of my mind...from the first visit in 2002, we were impressed with the cleanliness and professionalism of our Mexican dentist. My wife used to work as a dental assistant and knows what to look for, from a cleanliness standpoint. Algodones is a few miles west from Yuma, Arizona. Algodones is actually accessed through California. You park your car on the Arizona side at an American Indian parking lot and walk across to Mexico. Our dentist is located 2 1/2 blocks from the border crossing. On our RV travels to Oregon in 2001 we got a referral to use a Mexican dentist from a lady we went to church with. Several years later, we thank her every time we see her. That winter we drove 5 1/2 hours from Palm Springs to Algodones. It is now a 3 1/2 hour drive from Surprise, Arizona. Surprise to Yuma is not the most scenic drive, but we just think of how much money we are saving. We make our appointment for 10 AM, leave at 6:30 AM, and are back home by 3 PM. Get a book tape from the library, it would help pass the time. You would go to Algodones for three items...dentistry, eyeglasses and prescription drugs. Other than that, Algodones has little charm. It is said that Algodones has more square feet of dental space than any place in Mexico, maybe the world. You do not linger in Algodones, although it is quite safe, you walk across the border do your business and leave. We ate lunch once, it was okay. In the wintertime, with all the snowbirds, it may take up to an hour in the U.S. Customs line to get back into the United States. We go in the spring and fall when there are no lines. How cheap is the dental work in Algodones? Use a Mexican dentist and save...for a crown, it will be $200 to $220, around a $1,000 here in Phoenix. For a cleaning, done by the dentist himself, expect to pay from $30 to$40. A year ago, a friend said that his US dentist told him he needed three crowns, and he the dentist needed $3200. We took our friend down to Algodones. The dentist examined him said he didn't need any crowns, cleaned his teeth, charged him $30, and we returned home. 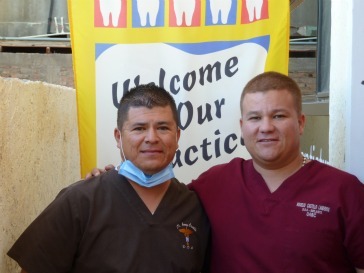 Not all the dentists in Algodones, are as conservative as our dentist. You will be approached by hawkers with cards for various dentists,when you cross the border... The good dentists, including ours, do not advertise like this...they don't have to, they work on mostly referrals. Here is Dr. Jerry...Gerado Castillo, DDS... He is on the left his younger brother Roy, also a dentist, is on the right. I do not receive a referral fee for patients I send to Dr. Jerry... Nor do I receive a discount on services. Use a Mexican dentist, another reason why retiring in Arizona makes so much sense. Doctor Jerry has moved his office... Right across the street from where the old office was... In a very nice mall with a courtyard and a coffee shop... Dr. Jerry will give you the specifics when you call for an appointment.